The Danida Fellowship Centre’s efficiency and expertise in addressing capacity development needs have proven to be of great benefit to the Danish Embassy in Addis Ababa. The Danida Fellowship Centre has recently worked closely with the Danish Embassy in Ethiopia to develop tailor-made responses to capacity building needs in several Danish funded development activities. These responses have included organising a study tour to Denmark on renewable energy for eighteen participants; a training course on green growth, climate change and environmental sustainability for eighteen participants held in Kenya; and a mapping of post-graduate courses in Denmark on green energy. Looking back at our collaboration with the Danida Fellowship Centre over the past few years we realize how much simpler life would have been if only the embassy had started this cooperation earlier, says Åge Sandal Møller, the Deputy Head of Mission at the Royal Danish Embassy in Ethiopia. Why use the Danida Fellowship Centre? 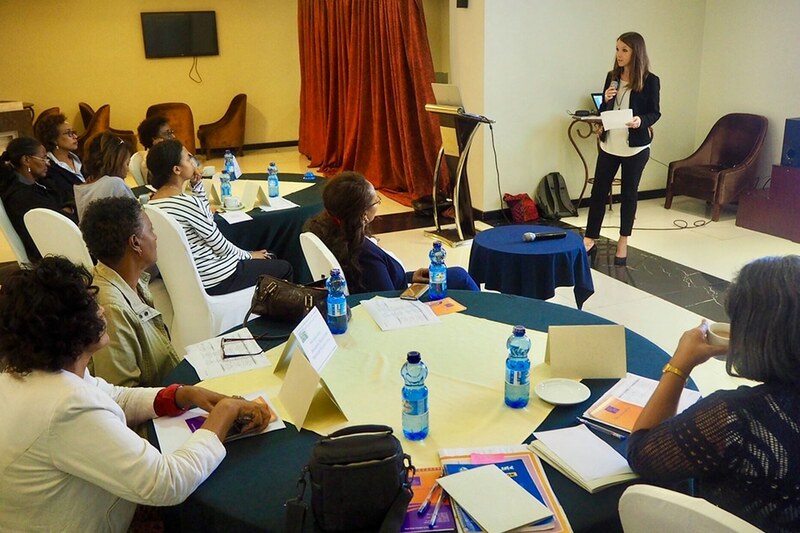 The result of this recent latest collaboration is two CAWEE Trade Missions to Denmark that were preceded by a workshop in Ethiopia for twenty business women. Read about the first trade mission. Mads Holm, the Green Economy advisor at the Danish Embassy, explains that the Embassy had wished to organise a trade mission for Ethiopian business women for some time, but did not have the necessary resources and skills available to do so successfully. Instead, they contacted the Danida Fellowship Centre that had previously organised training and study tours on their behalf. The Danida Fellowship Centre brought up new ideas on how to improve the Embassy’s initial approach to this trade mission, says Mads Holm. Subsequently, the organisation of the trade mission was outsourced to the Danida Fellowship Centre and a consultant. The Embassy was still in control and could influence the delivery throughout the process. Mads Holm goes on to explain how the process panned out after a couple of good meetings with the Danida Fellowship Centre in which the project objectives and the Embassy’s involvement were outlined. The Danida Fellowship Centre put the project out to tender inviting bids from its roster of prequalified capacity development support providers. There was a high degree of interest despite a relatively short deadline. The Embassy was closely involved in the development of the terms of reference and the selection process, but it was a great benefit to us that the Danida Fellowship Centre did the legwork for that can often be quite demanding, says Mads Holm. Even after the consultant had been selected, the Danida Fellowship Centre and the Embassy remained deeply engaged in the project, continuously keeping abreast of its progress. The great advantage of working with the Danida Fellowship Centre is, according to Mads Holm, the speed with which the centre mobilises as a strong partner. The Danida Fellowship Centre relieved the Embassy of much of the groundwork needed to prepare the workshop and the trade missions. It provided the Ethiopian business women with the best possible and most professional inputs to be successful in Denmark. Throughout the process, it was entirely up to the Embassy how much it wanted to be involved. We remained constantly in the loop and followed the process all the way along, and we have received a lot of praise from our stakeholders in Ethiopia who see this project as being our initiative, says Mads Holm, adding that this praise was also due to the work done outside the limelight by the Danida Fellowship Centre and the consultant.